Chris presents an information packed lesson on many different Vai-inspired guitar licks and riffs. 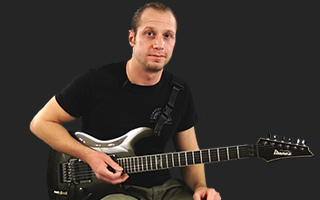 Learn the licks from the introduction video and apply them to your own style of soloing. This lesson covers a number of Vai inspired licks. Most of them are from the "Intro" that you saw/heard in Lesson 1 of this series. A couple of them are other ideas I had left over after I was done writing the Intro and didn't know where to put them. For the licks found in the Intro, I have provided PDFs of the Tab. It is very important to note what chords are being played under each lick. Even though the Intro consists of only 3 chords, (E5, G5, and A5) there are a number of modal changes that occur as you work through the licks. For example, once the A5 chord is played, the initial lick interprets the A5 using A Dorian. When the first tap lick comes in, A Mixolydian is used, and then for the faster taps at the end, we switch to straight A Major. The beginning of the Intro is played in E Lydian and then modulates to G Major where there is a D Major arpeggio being played over the G5 chord. There is then an E minor run played over the G Major chord. These licks are classic examples of the concepts taught in Lesson 3 (Melodic Invention/Technique). There are simple chords being played and held, but the lead guitar is adding all sorts of tonalities that make the basic power chords interesting. The ideal application for these licks is not necessarily to learn my Intro found in Lesson 1 note-for-note. In fact, if you go back and compare what I am playing to the provided tab, you'll notice that, even though ideas and some of the licks are identical, there are some obvious differences and note choices. It is perfectly normal to have a number of licks in your bag and then, when playing over a song or track, they are changed and massaged to fit the mood and pace of what is being played. This is the practical application of phrasing. Never assume that you must learn something, put it in a box and play it that way every time. My recommendation is that you record your own "backing chords" or use the provided backing track in Lesson 1 and experiment with the placement over some of these licks over the chords and see what comes out. Since there is no click track, you can practice phrasing some of these ideas however you'd like. Record yourself if you can, and listen back to how you are interpreting the track. The other two licks demonstrated and tabbed can be played over A Mixolydian and B minor respectively. Using the theory concepts applied in Lesson 3, see what other chords you can play under these licks. For example, the fast B minor lick could be played over a D Major chord for a straight major sound, or a G Major chord for a Lydian sound. Have fun and see what you come up with!